I think lots of us pretend we’d love to drive big, powerful, fast cars because it is the ‘thing’ to do. I confess I sometimes worry so much about scratching/damaging them, breaking speed limits, feel like everyone else ‘knows’ stuff about them or are far better drivers than I, that much of the enjoyment can be dissipated. Don’t get me wrong. I truly love driving a powerful motor down the back straight of a racetrack. I find it exhilarating. But my poor ould heart skips generations of beats and my stomach spin-dries my intestines sometimes when I power into a racetrack corner and feel I haven’t the control, courage or ability to go at it full tilt – like everyone else seems capable of doing. Many a driving coach has told me to leave my public-road good manners and driving modes in the pits. Unfortunately, by the time I’ve shaken them off, my allotted half hour or so of burning rubber concludes, and I leave feeling frustrated and caustically self-critical. Ironically, my task this week was virtually the direct opposite. It was to drive a specially empowered AMG 43 Mercedes E-Class saloon on our roads without being a bold brat – while still giving the car a reasonably good workout. Many a time I’ve taken a car like this 401bhp AMG and ripped around Wicklow hills and bog roads in low gear within legal speeds. It is the only way to sample a car’s potential (stress ‘potential’). But a bit like the other side of the equation with race tracks, I have been left feeling cheated many a time. Like being given a bag of crisps when you’re yearning for a steak and chips. In truth I sometimes struggle to see much sense in driving a car like this on the road here. I distinguish between ‘driving’ and ‘owning’. As I’ve often said you have to take cars like this to Mondello Park to properly enjoy the driving. But owning this, I could see from my several excursions, could be fun if you feel you could fend off the daily temptation to drive it hard. Indeed I feel you’d have a better chance of living with, and enjoying, this than many a high flier. It is different from most powerhouses I’ve road-driven because it doesn’t convey a flamboyant sense of being a snorting, raging bull trying to burst out of its own skin. Based on the E-Class saloon, this AMG 43 coats its prowess (air sport suspension, bi-turbo 3-litre, 401bhp) under tame lines, leaving the ‘snorting’ button for you to press if, and when, the opportunity arises. Yes there was a, relatively speaking, mild growl and the odd little ‘backfire rasp’ from the tailpipes coming down off high revs in Sport + mode. That low-pitch timbre was wonderful. And there was a deceptive nonchalance about its accelerative ability (0-100km in 4.6 secs is quick enough) as I put it through cadences of zip and zest tempered by prevailing speed and traffic. The air-sport suspension will get much tougher workouts than I gave it, but regardless of surface, twist or counter-demands, it contained and transmitted loads of energy. On poorer back roads the standard four-wheel drive gave rock-solid grip and steer, though the car felt too clunky over rough surfaces. It was a car I drove for the pleasure of driving; not for the sensation of outright rasping performance. That’s an important distinction as this accommodates energetic driving while retaining the seating and boot practicalities (albeit for €93,000) of the ‘basic’ saloon. But is it a waste of money because you can’t have the full-on steak-and-chips every day? I was inclined to think so yet there were those memorable occasions I had the opportunity to push hard (lower gears) and boy, did this drop its mask and reveal devilish muscle. Justification for buying? Probably. How does it measure up to performance saloons such as the Audi S6 or Maserati Ghibli S? I’d have to say they are much different experiences with contrasting credentials. The Merc hasn’t that pulsating-power feel to it but I’d prefer it on-road I think (I’ll probably have to eat my words next time I drive any of the rivals). Tough choices. Of course, all this is Dreamsville for most of us. But for the handful who can, buying a car like this is all about what you want and get for your money. If you lust after more ostentatious transport go buy a Porsche or Ferrari but you’ll pay, and pay big. I think that, for €93,000 (includes their new 6pc discount) and for what it can do, you’ll not get a more broadly pleasing drive than the AMG. The key for me was how it blended enough AMG with ‘OMG!’ to keep me onside. Maybe I should have brought my race-track mindset with me and been more brutal. But what would I have achieved? Penalty points? No thanks. I’d rather it this way. It’s a neat feat to have conjured a happy medium between moderate beauty and snorting beast. 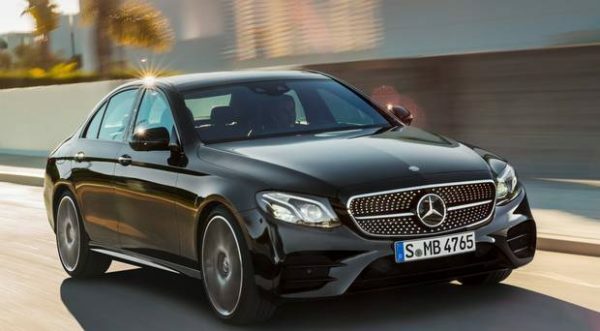 Mercedes AMG E43 4MATIC (4-wheel-drive) saloon, 3-litre (2,996cc), V6 bi-turbo (0-100kmh 4.6 secs; top speed 250kmh), 401bhp, 8.2/-8.4l/100km, 192g/km, €1,200 road tax, 9spd automatic transmission. Price from €93,365. Test version €97,943. Delivery/related charges extra.